Back in August, Y Combinator held its summer session demo day, introducing the world to 60 new companies in one of its strongest batches to date. One of these companies, DoubleRecall launched as a platform that enables companies to roll out digital campaigns that actually succeed in prompting users “to read an ad,” rather than scoff and click elsewhere. In that sense, the Y Combinator alum is looking to replace — or at least become a complement to — paywalls with simple, CAPTCHA-like messages that have the potential to be less annoying revenue generators. 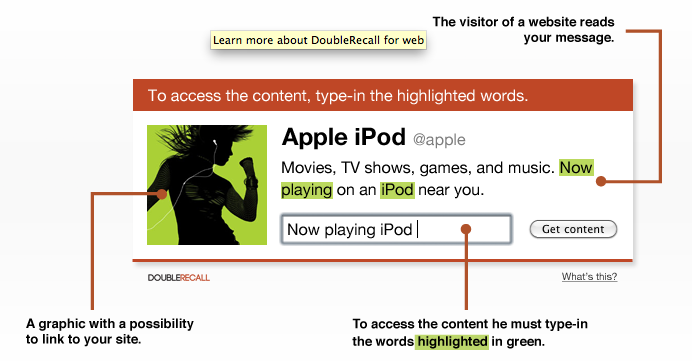 For example, DoubleRecall might offer its service on a news article, which would contain a CAPTCHA-like recall mechanism that would prompt readers to pick out a couple of words from the text and enter them into a textbox. The idea is to create experiences that are quick enough for users to navigate that they lower the barrier and obnoxiousness level and are targeted and clickable enough for brands to actually make money and potentially avoid using a paywall altogether. As to the effectiveness of this model, DoubleRecall says that the campaigns it ran over the course of Q4 2011 showed an 82 percent engagement rate, versus one to three percent for paywalls, an average CTR of 3.6 percent, and an elevenfold increase in brand awareness, versus using banner ads. The startup closed the year with $300K in revenues, which isn’t too shabby for having been up and running for four months at the end of the year. These results have been intriguing enough that investors are buying into DoubleRecall’s strategy, as the startup has announced that it has raised $1.6 million in seed funding. Like the other startup’s in YC’s summer batch, DoubleRecall was offered $170K from Yuri Milner and SV Angel’s Start Fund, as well as Y Combinator. Since then, Digital Garage, Itochu Ventures, Mentor Equity and TEEC Angel have all joined in to bring the round to $1.6 million. Sure, this model is great, in that it’s got the potential for publishers to monetize through an alternative approach, and readers don’t have to wrestle with paywalls, but with this slight description, readers may be inclined to see this as a me-too idea very reminiscent of the same strategy that has seen Solve Media attract buzz and venture capital. DoubleRecall COO Julien Coustaury tells me that the main similarity between Solve and DoubleRecall is that, at some point, a reader has to retype words from text into a textbox. Solve’s “TYPE-IN” platform replaces those fuzzy CAPTCHA words and numbers with a brand message or logo, with an input box. Essentially, they’re using input boxes for advertising. DoubleRecall, on the other hand, doesn’t want to advertise on the input box, but instead wants to serve some non-branded text readers have to recall, and use that to unlock content. In most cases, this would come in the form of pay walls. Sure, publishers, content producers need to make money, but readers generally shudder at pay walls, especially if they’re not loyal customers of the brand in question. Those who read the Wall Street Journal everyday don’t mind paying a bit more for some of their content, while casual readers may seethe at finding a pay wall, when they were looking for a specific article that couldn’t be reached other than by paying. Thus, DoubleRecall works with publishers and sites to maintain this wall, but replace it with another gateway. They get the user clicks, show the content they want to show, and then get to give readers access to the content anyway. It can be a win-win, although there’s still a lot more testing to be done. DoubleRecall is opening headquarters in NYC this month, as it works to expand its reach internationally (the team is originally Slovenian, and gained a bit of European traction in the earl-going), launching in Japan later this month. So far, the startup has signed on 40 publishers and 50 brands in total, and will look to use its new infusion of capital to fuel this international expansion and ramp up hiring. The company also has a social component to let brands share the best from their social media streams, as well as real-time monitoring and report making to enable them to instantly adapt to feedback. For more, check out DoubleRecall at home here.